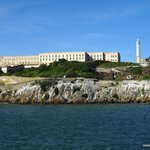 The Avalon Casino – very interesting building with a great history and awesome views. Beautiful walkway leading to the Casino from Avalon Bay. Trolley ride – it doesn’t provide any views of the harbor even though you go up the hill. Unless you really want to visit the Botanical Garden there is no reason to take the trolley. The Nature Discover Center – close to the top of the hill, it is a small exhibit about the plants, animals and history of Avalon. Unless you’re spending a few days in Avalon and have time to spare, it is not worth visiting. We left early in the morning and took the Catalina Express from Long Beach. 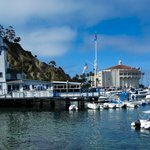 After passing by the famous Queen Mary docked nearby, in under one hour we came to Avalon Bay at Catalina Island. As we pulled into port at Avalon, we were struck by how beautiful Avalon Bay was. Perfectly shaped as a crescent with many small luxurious yachts anchored in the middle, Avalon Bay was just post card perfect. Absolutely gorgeous! Yes, we did see pictures online but we were very surprised when we came upon it with our own eyes. It was simply beautiful in the morning light. We immediately realized how much Avalon looks like the small villages on the French Riviera. There were also some colorful houses on the hill which resembled Cinque Terre in Italy a little bit. We got off the boat and after looking at all the available tourist activities we decided to not do any of them. We wanted to relax and just walk around, which is usually our most favorite way of visiting a place. So, we started walking around on Crescent Avenue which follows the shape of the harbor. Colorful house fronts and hotels with red tiled roofs took our imagination immediately to Cinque Terre and Tuscany in Italy. However, the lively Mexican Restaurant, El Galleon reminded us that we were in fact in California. 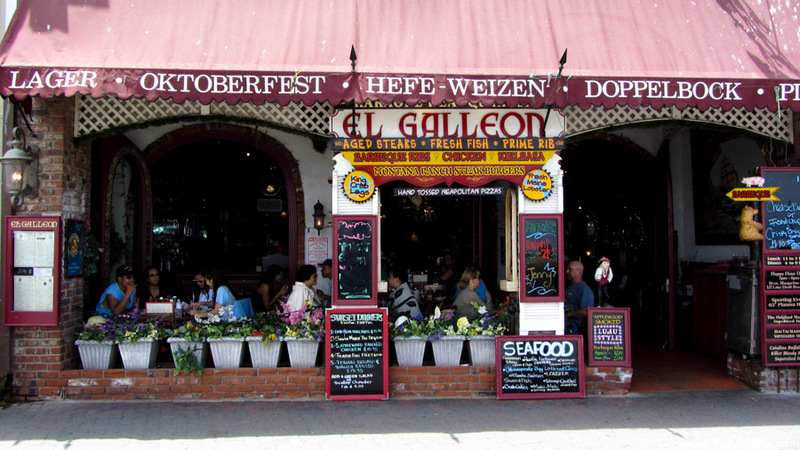 Avalon, Catalina Island – The El Galleon Mexican restaurant on Crescent Ave. This is a colorfully picturesque sight right across from the Avalon Pier. We took the small trolley ride to the top of the hill and admired the Spanish style entrance to the Wrigley Memorial and Botanical Gardens. However, we decided not to visit since we wanted to return home the same day and did not have a lot of time. There was much more to see. Next, we got off the trolley at the Avalon Casino building. We found out that we could only go inside if we purchase a tour. So we did and we were very glad we did so. The Avalon Casino was never designed to be a gambling casino. Instead, the Avalon Casino was built as a movie theater and banquet building. Built in the 1920’s in less than two years, the Avalon Casino had the latest technology in lighting and sound. It was beautifully decorated and the wall paintings were simply beautiful. The big attraction of the tour was the top floor with its round banquet room and access to the balcony. Everyone on the tour rushed through the banquet hall to the balcony. Oh boy, what a view! We stood there for a while admiring the colors and the sights until our kids had enough of looking around. 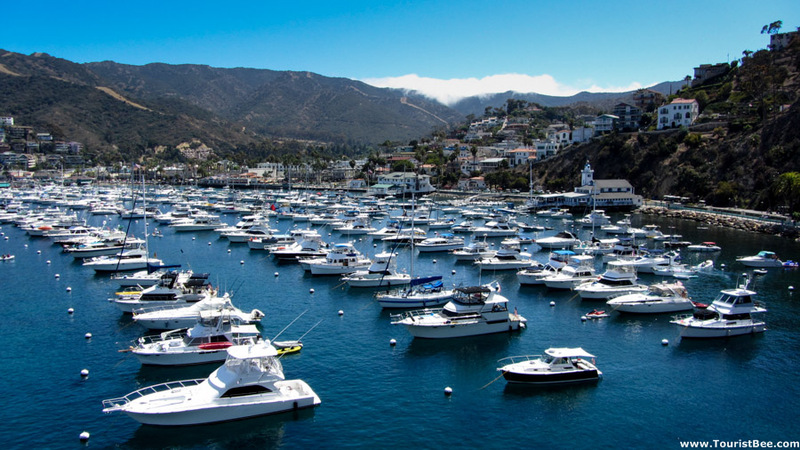 Avalon, Catalina Island – Amazing view of Avalon Bay seen from the top floor of the Avalon Casino. Descanso Beach was our next stop on our walking tour of Avalon. This is a very small harbor and beach bordered on the north side by a tall mountain. This is where Descanso Beach Club is and this place was packed…really packed. 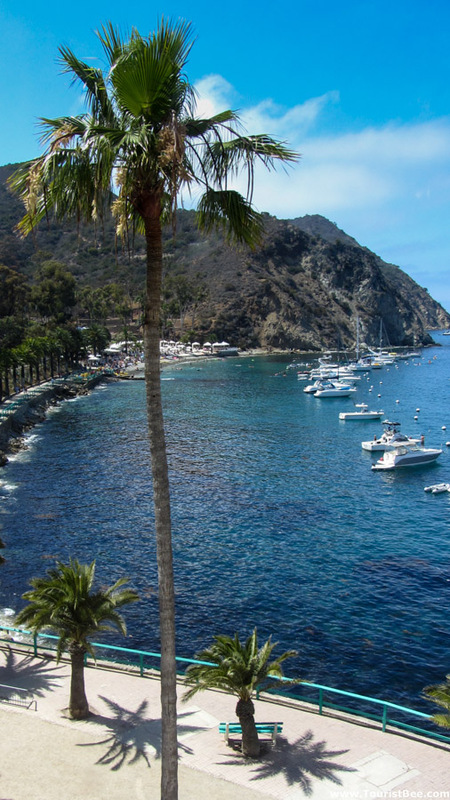 Avalon, Catalina Island – Descanso Beach and harbor seen from the Casino top floor. It immediately became clear, however, that Descanso Beach was not a place for young children. There was alcohol, very very loud music and lots of young adults having a good time. This is a very picturesque place with beautiful surroundings but we could not stay long. So we walked back to Avalon Bay to finally allow our kids to go in the water. Passing the Casino and Lighthouse we stopped at Big Olaf’s ice cream shop. We have read about it online so we wanted to try it. The ice cream was good but not super amazing as we had read. Their ice cream cones topped with whipped cream definitely looked awesome but again they did not taste spectacularly. Just good ice cream. We ended our day at Avalon Bay on the beach. The water was pretty warm and the beach was great. Our kids loved it. 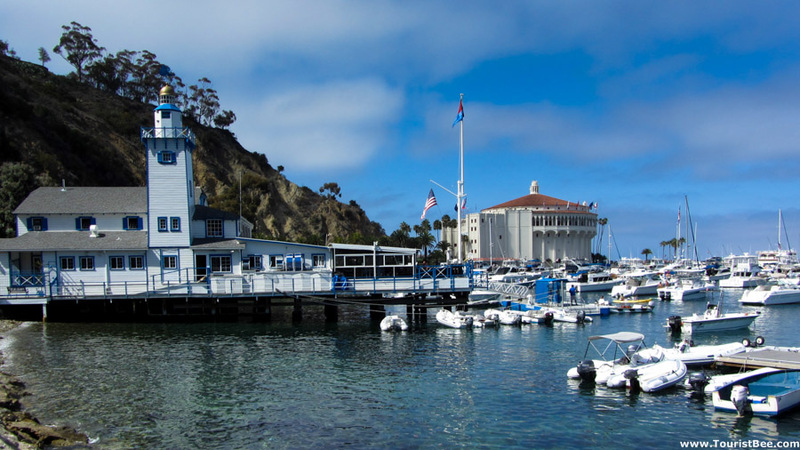 Catalina Express is the company that operates the transportation routes to Catalina. They have frequent trips each day, but the weekend trips need to be booked in advance because they fill up quickly especially in the summer. You can clearly see that we loved visiting Avalon at Catalina Island. Avalon was a surprisingly beautiful place right in our backyard in Southern California. We enjoyed very much walking along the harbor, visiting the Casino and simply laying on the beach. 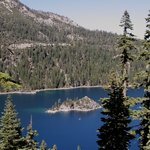 This was one beautiful spot which will go right away as one of our favorite places to visit in California. 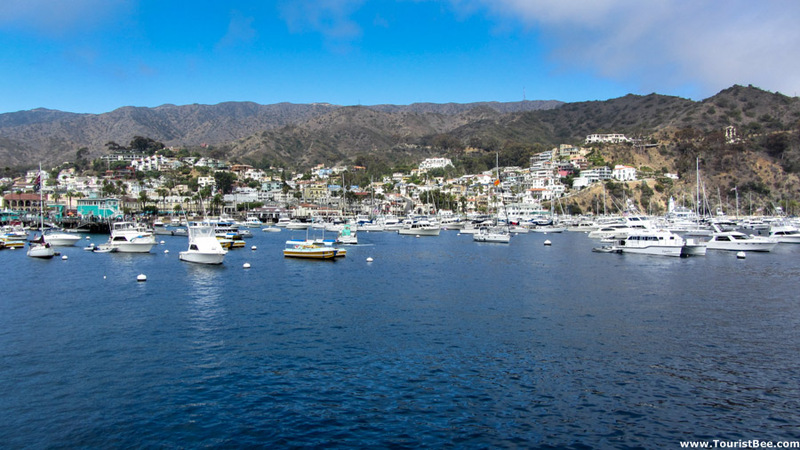 Catalina Express boat service: Catalina Express.